Enjoy an expertly designed week in Eastern Sicily visiting some of the most historical and delicious sites the region has to offer. Our week begins in Siracusa, and this will be our home base for the entire week. Siracusa, filled with Baroque architecture, is a wonderland of ancient civilizations that still resonates in the streets of this beautiful coastal city. Sicily is an easy flight from Rome, and you will want to land in Catania, Sicily's second largest city. 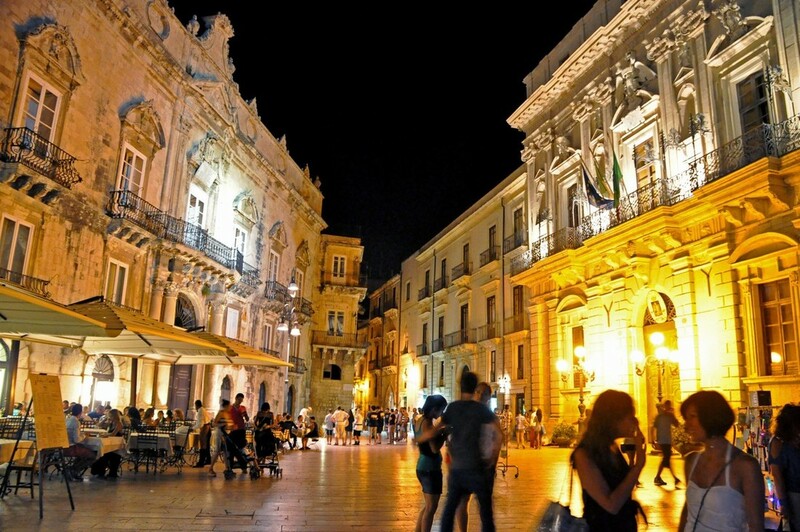 Our hotel is in Ortigia, Siracusa's city center and what is considered the "old" part of town. Enjoy a welcome drink before heading off to your first taste of Sicilian cuisine. Some of our highlights for the week include private cooking classes, plenty of day trips to UNESCO World Heritage sights such as Noto, Catania, and Etna for a wine tasting and delicious meal in a local farmhouse. A trip to Sicily would be incomplete without a visit to the beautiful seaside town of Taormina. We will enjoy a hands-on cooking class in Taormina, that will be both educational and a truly unique experience. A typical Sicilian menu is sure to be had. Walk off all the delicious foods from the week with walking tours led by locals and natives. Group meals are fun and delicious! Arrive at the highly rated and centrally located Hotel Gargallo to check in, unpack and settle in. Get to know your new host city by taking in all the sights and sounds. Perhaps grab your first gelato of the week, but save room for dinner. Meet & Greet: In the evening, we will enjoy our first group activity with a welcome dinner. We will get to know our fellow travelers, get a first taste of Sicily's unique cuisine and enjoy some local wine. Questions about the week will be answered so you know what to expect during the week to come. Ortigia's food market is an explosion of sight, sounds, smells and tastes! Today, we head out to visit the wonderful Mercato di Ortigia. Walk about this old market and sample products along the way. With our guided tour, we will purchase items to bring back to a local home for our cooking class. Prepare a typical Sicilian meal with fresh products and enjoy a leisure lunch with wine afterwards. The Cathedral in Noto reopened in 2017, after 10 years of restorations. The starting point to the valley of Sicilian Baroque, Noto, a UNESCO World Heritage Site, is a stunning little city that begs to be explored. The city was rebuilt after a powerful earthquake and its most famous monument, the Cathedral dedicated to San Nicolo, along most other buildings, collapsed in 1996 and it wasn't until 2007 that it reopened. The heart of Noto is Via Vittorio Emanuele. Enjoy a stroll as we walk up and down the street and visit Piazza Immacolata, the Franciscan monastery, and the church of Santa Chiara, among other notable structures. After a visit to Noto, we head towards Marzamemi, a quant little fishing village known for producing Italian canned tuna, bottarga and smoked swordfish. We will enjoy a delicious lunch, as the scent of the sea engulfs us. The wines produced on Etna's soil are unique due to its unusual terrain. Located between Catania and Messina, Etna is the highest active volcano in Europe, and is actually always in a state of activity! That's really great news for wine lovers and local merchants who rely on its fertile volcanic soil to produce unique wines, as well as growing some wonderful produce such as oranges, lemons and olive trees. After visiting Etna and learning its history, we will enjoy a most delicious lunch, right on location at one of Etna's most famous wineries. After a guided tour of the estate, we will learn how the grapes are grown in such a unique environment, and learn the history of this family estate. We will have time around Etna to admire the unique beauty, leisurely enjoy unique foods and wines and purchase some lava souvenirs to bring back home. This morning we will enjoy a private food & culture tour of Catania, expertly led by a native guide. We will learn all about the history of this interesting city, often called the "black city," due to the color of the buildings, blackened by soot and ash from the nearby volcano. Learn about its frequent sad history, walk the baroque streets all while enjoying some delicious local food & wine. A UNESCO-World Heritage site, the city's fighting spirit will be evident, as we learn how, despite its tragedies, it has always managed to bounce back, even better than before. Our walk will take us to Via Etna, the Duomo, the Elephant Fountain, the Cathedral and the Amphitheater. But being also a foodie tour, we will visit some of the best local wine bars and foods shops along the way. The piazza in Taormina is waiting for eager visitors. ​Castelmola, a small town located on the hills above Taormina, is a quaint little village, considered one of the most beautiful towns in all of Italy, thanks to the amazing views of Taormina, the beaches and Mount Etna. Here, we will enjoy a guided tour as we walk about the streets, along with the locals. Named as the "Pearl of the Mediterranean," Taormina is our next stop and is a must-visit destination for anyone making their way to Eastern Sicily. A favorite for travelers visiting Sicily since the 19th century, Taormina can easily be called the tourist capital of Sicily, and for good reasons! Its beauty is unmatched! In Taormina, we will enjoy a hands-on cooking class with a local chef, and also prepare some of Sicily's best-known desserts. After a bountiful meal, spend some free time in the city, where you're sure to find some unique souvenirs. Enjoying a delicious outdoor meal in Bologna. Our time in Sicily is winding down and by this time, we've eaten our way through some of Eastern Sicily's most delectable cities. Today, you'll enjoy some time on your own to shop, return to a magical site in Siracusa, or simply enjoy Italy's Dolce Vita by relaxing by the sea and people watching in the town piazza. A delicious final farewell dinner is planned for our last evening in Sicily. Enjoy some time with your travel companions, exchange stories and contact info as we salute to a wonderful week in Sicily! Day trips are educational, fun and delicious! Our home for the week will be the small boutique hotel Hotel Gargallo. Located in what is considered the "old" part of Siracusa, in Ortigia, the hotel is centrally located for easy access to some of Siracusa's main attractions. Small, with just 16 rooms, Hotel Gargallo is in the city center, within close walking distance to the city's precious treasures. Enjoy the attention given to our group from this family-run hotel rated as one of the top hotels in Siracusa. Enjoy a delicious, freshly prepared breakfast every morning, before we head out for our day's activities. We will get to know Eastern Sicily well during the week and our day trips include visits to: Etna, Taormina, Castelmola, Catania, Marzamemi and Noto. Activities include cooking and baking classes, winery visits, culture tours and many more surprises along the way! WHAT CITIES WILL WE VISIT? Sicily is HUGE! One could easily spend months touring Sicily alone and not see all the highlights that this beautiful region has to offer. Because our time is limited to one week, we will focus on the Eastern side. But don't worry, you will still see plenty of beauty and uniqueness while here. Siracusa will be our home base, and we have many day trips and stops planned to get us to see as much of this side of Sicily as possible! ​The cities we will visit include Etna, Taormina, Castelmola, Catania, Marzamemi and Noto, with many surprises along the way! WHO IS MY HOST & LEADER FOR THE WEEK? 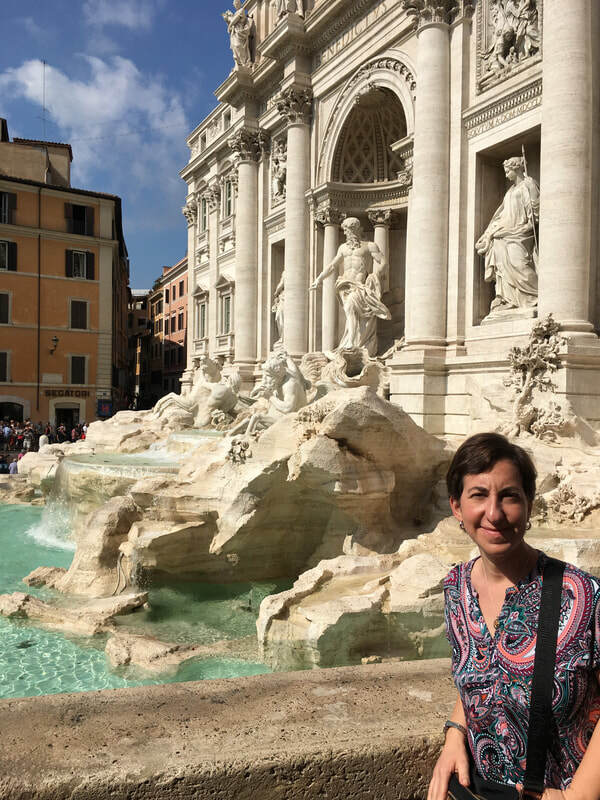 Francesca, native Italian, culinary instructor, cookbook author and Italian travel expert will be your guide for the week! Francesca, a native of Calabria, neighboring Sicily, will expertly guide you through this often misunderstood and unique region. Francesca is fluent in Italian, well-traveled and passionate about all things Italian. Francesca believes you haven't been to Italy, until you've been to Sicily! Hotel incidentals such as phone calls, room service and minibar. Meals, snacks and wine not stated above. Airport / Train transfers on first and last day of tour (tour begins and ends at the hotel). Travel Insurance: Travel insurance is HIGHLY recommended in order to protect your travel investment. Hotel City Tax of 1.50 Euros per person / per night, for the first 3 nights, to be paid directly to hotel by guest. Above price is for check payment only. Credit cards are accepted. ​If you would like to reserve a spot for this tour, or have any questions, please use the contact form below and we will send you the necessary booking instructions or additional information.